My last project restyling an old mink fur coat for a client. The coat was inherited from her mother and she wanted to wear that coat but it should be made in her size and with a more modern look. 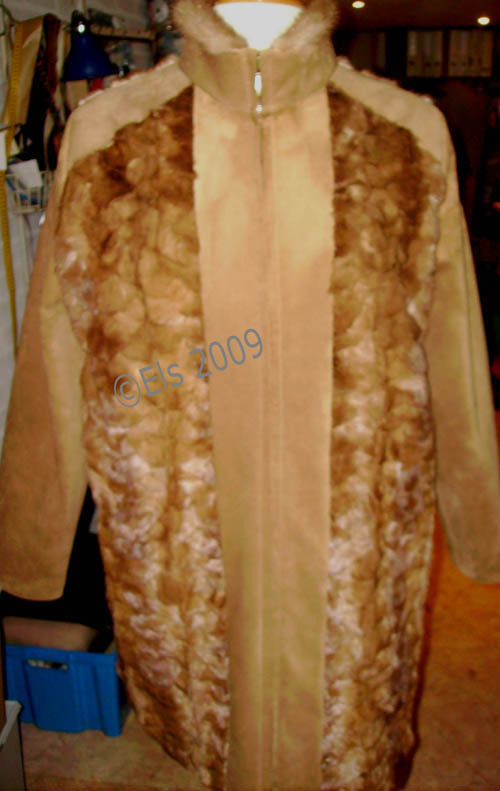 The coat was too large and the design old fashion.The mink fur and leather side were still in an good condition to make it work. 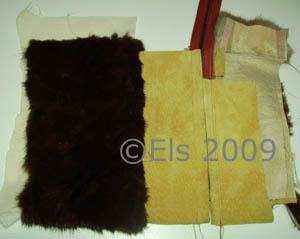 The tools I use for working with fur and pigskin suede, my furrier knife to cut the fur, a leather knife to cut the leather, a hammer to pound the leather seams, textile adhesive tape to stabilize the cutting lines of the fur, special leather interfacing LE420, glue for leather, plus handsewing glove needles size 9 . My old but sturdy Singer 20U for sewing the suede , I used special leather needles size 90 and thread size 80 for sewing and size 50 for top stitching the zipper. You can see me at work using my Allbook Hashfield fur sewing machine a small video from me while I was sewing white rabbit fur with my fur machine. ( the video was taken with a simple photo camera so the quality is not that good) , but it will give you an idea how such a machine works. 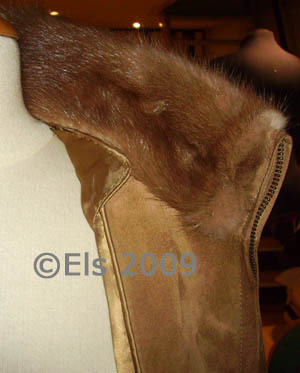 I used a sewing awl to push the fur hairs to the inside. 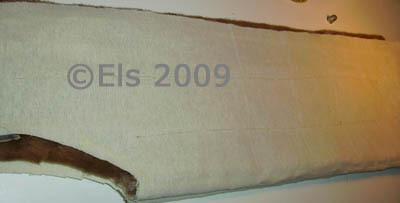 I used two different lining fabrics for the sleeve lining. 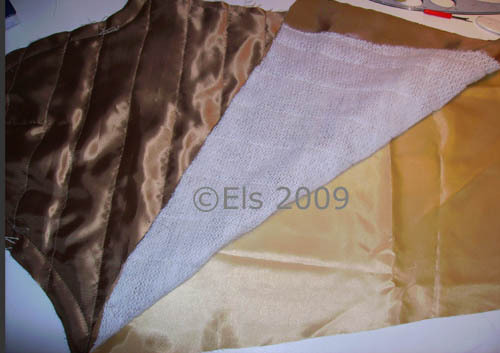 I stitched the heavy satin lining to the lambs wool and used a thinner lining fabric as a backing so there are no visible stitching lines towards the leather side of the sleeves. 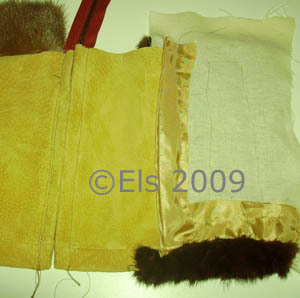 I started sewing some samples since I never made a real fur garment , but I attended a two-day workshop 2 years ago at the Dutch Fur Institute where I learned to use a fur sewing machine and some sewing techniques. 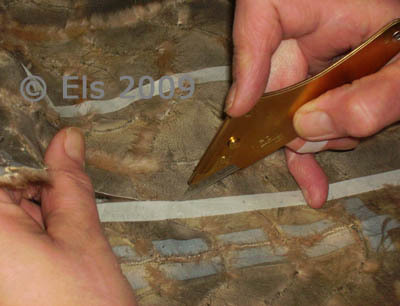 The procedure in sewing this coat is making samples and a lot of brainstorming making a plan for sewing directions taking notes and find a way to sew without pins, basting, and marking on the right side of the fur or leather.The fur pattern parts seam allowances are only 2-3 mm wide , so there is no way to alter the final garment. I did made 2 muslin coats for fitting in unbleached cotton to modify my self drafted pattern. 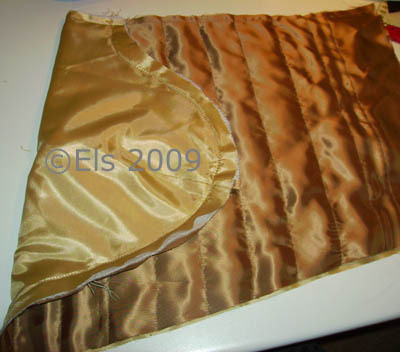 I also added an inside pocket with triangles at the edge to embellish the pocket. 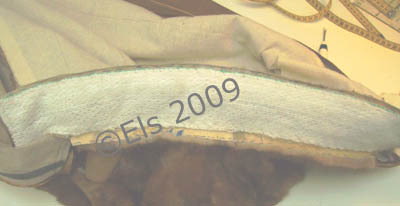 Two way zipper sandwiched between front and facing, and corded piping between facing and lining. Please do not copy or use my pictures or text. Oh wow…. this turned out fabulous Els! I think if anybody would have ask me to do this I would have ‘run for the hills’. 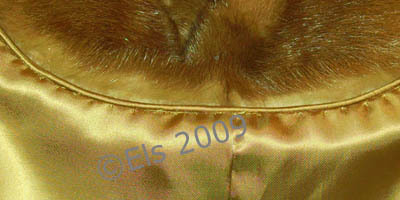 It’s a mammoth task to restyle any coat, but a fur one is even more challenging, due to the nature of the ‘fabric’. The idea of using the suede makes it indeed more contemporary – gives it a fresher look. Great job, indeed. My respect! Oh, Els, I am so impressed! I am sure your client was very, very happy. Wonderful work, Els!!! Wish I could have been there to help with all that work, very intense. But such a beautiful result. Love the restyle, you’re an inspiration! My industrial sewing machine dealer has several of those fur machines. I’ve been tempted, but I so rarely work with fur, but it’s fun to see it in action. And your results are, as always, stunning! Wow! Boy am I impressed. It looks just gorgeous. I’m sure you have a very satisfied customer. Wonderful result, with a difficult job. This is an area in the sewing field that I’ll never explore. I’m intimidated (and don’t wear fur, real or faux). The piping and pocket details are beautiful. Amazing contemporary garment! What a stunning remake! Kudos. Totally awesome! What a great coat. You are one fantastic sewer. Els, your re-fashioning of the coat is wonderful. Recycling older furs is such a great idea. I bought this book recently when I was at the Claire Shaeffer workshop in January – she had an extra used copy she was willing to part with. I highly recommend this book also, for anyone wishing to take the plunge into leather sewing. The text and photos are very clear. I felt like I might actually be able to do it! Love your photo of all your tools, too. Thank you so much for sharing your process. Um, wow! What a fantastic job with so many fine details. I found the whole post fascinating. Thank you and your client for sharing with us. Els the other posters before me have said it all, this is truly awesome work. I guess when you know how to and have the right tools then it isn’t as daunting as it looks. As one poster said though, I’d run to the hills too if someone approached me with such a request. Thanks so much for taking the time to document the process and for sharing. Fantastic job on refashioning this fur coat (it’s a masterpiece)and as always I learn so much from you, so thanks for sharing. Good morning and thanks for your posting. I just got a similar machine (old Bonis New “Never-Stop” Model Fur Machine – black in color) and I am having trouble getting a good consistent stitch. Part of the problem is that I’m not sure how to properly thread the machine as I don’t have an instruction manual and wonder if you could give me some pointers? I too would appreciate any information on how to thread a Bonis “never-stop” fur machine. I just inheirited one! I also just got a Bonis Never Stop fur machine. Would you please forward that threading information my way too?!?! Much appreciated! Quite well you advised yourself with this old fur. As the professional furrier I am impressed. Tell me please how in England the Furrier profession is enjoying the great interest ? I see you are using a fur machine, and have just read elsewhere that one cannot sew fur on a regular machine, only on a fur machine. Is this because of the hide? Or the actual fur? 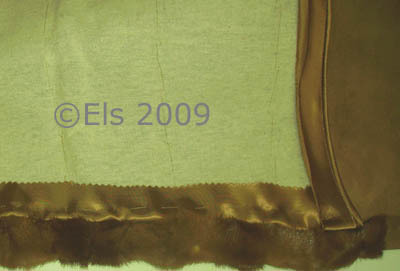 I have a vintage fur I would like to remake, but now am at a loss because-no fur machine. Is it possible to buy these used? Any suggestions? Thank you! 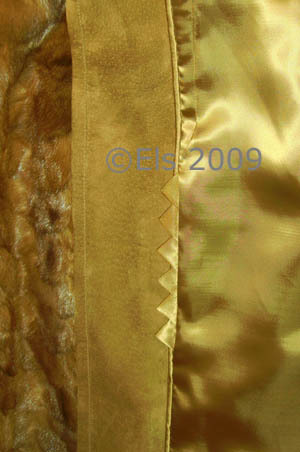 The seams in fur are very tiny and flat that’s why you need a fur sewing machine. 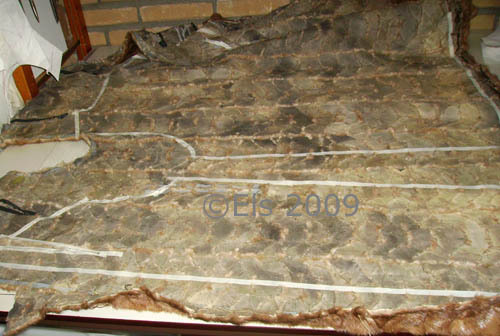 A fur coat is made of numerous small pelt pieces which needs to be joined together in an invisible way and a fur sewing machine is the only machine which performs this kind of seams. 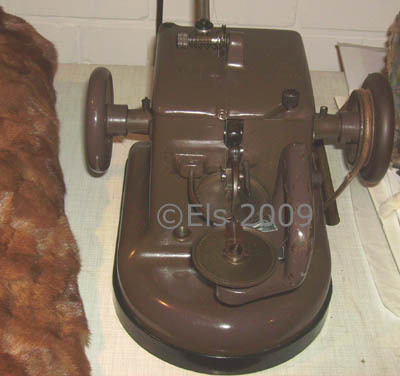 The fur sewing machine Allbook Hashfield I bought, was a used machine and those machines are still used in Europe as well as Australia and New Zealand. 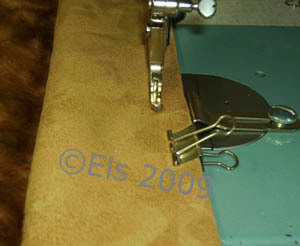 http://www.archsewing.com/usedmachines.html sells also used fur sewing machines. excellent and informative post. good job on the coat! Great display of work, you must love it. I’m from Chile S.A. and just got a used Singer fur sewing machine model 176-21. And I’m trying to find the looper . At the list of parts ,the number of the looper is 176388. Here no one have it. Any idea how and where to look at the U.S.A. I have a Osann Fur Machine. It looks to be identical to the Bonis. I am having trouble getting the stitches to be consistent. I am not sure that it is threaded properly. Could you please send any information. Thank you. Gary, information sent to your mailbox. I am having trouble finding the furrier tools you are using. 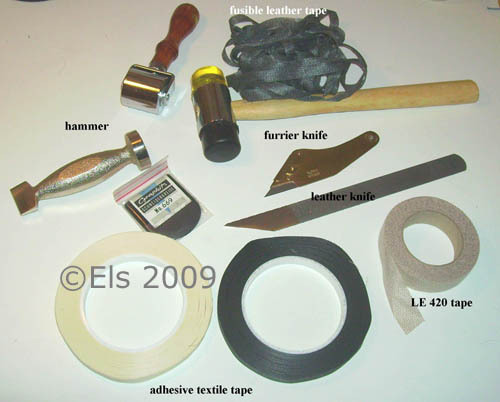 I am interested in purchasing LE420 tape, textile adhesive tape, glue for leather and a furrier knife. 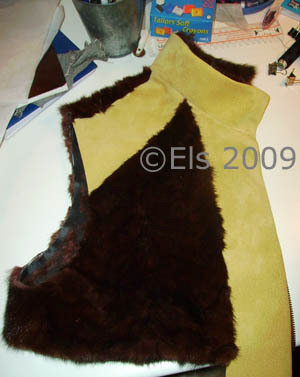 Also, I am really interested in furrier classes/workshops but have not been able to pull any thing up on the internet. 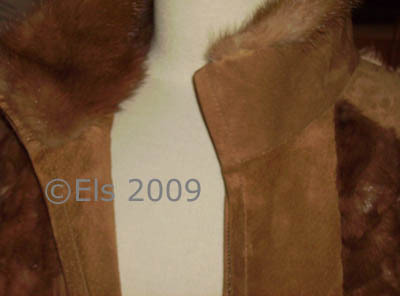 I recently purchased 3 fur coats that were vandalized (slashed in the back) so I am hoping with the use of the leather glue, I will be able to salvage one of the coats to wear. The other 2, I will take apart for making other “furry” things. A few years ago, not being aware of fur machines, I took an old muskrat coat apart and rebuilt it to fit myself using my Serger and Singer sewing machine. I didn’t have any problems and ended up with a good fit. However, after viewing your mink coat project, I see that a fur machine is a must. Thanks for posting it for all to see. Anxiously awaiting your response. Or inquire for a used fur sewing machine at an industry sewing machine dealer. Could you tell me where you ordered your feet and if you’ve ever come across a welting foot? I know I can use a zipper foot but most everyone says the welting feet do a much better/easier job, I believe because you can get closer to the cording and the foot is designed for that. If I am successful I have a few more things to do and lots of welting, hence my desire to have this specialty foot. I’ve looked up Singer 20U but have had no luck in finding a foot for this machine. Do you know what feet would fit this machine? I haven’t seen anything but straight, zig-zag, and zipper feet specifically for this machine, but I have to believe that some feet made for other machines should work with this machine as well. Any input would be greatly appreciated.. I like your work very much. Do you take orders? And, if yes, how do I contact you? Thanks for the compliments on my work. Yes I do take orders . You can contact me via email see “about the authors “for the address. 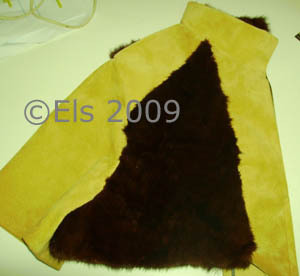 Looks nice, must be a good experience sewing with fur, I think I will try it for sure. 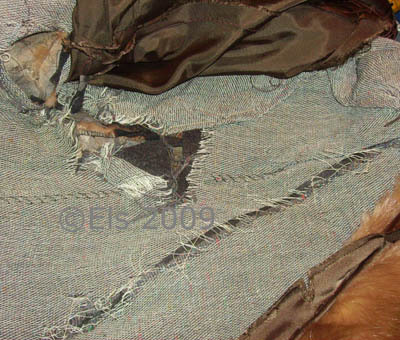 Hi just found your helpful website as i would like to remodel an old fur coat into a parka thats been in the wardrobe for years…I am a good dressmaker but didnt think there was so much to working with fur so Im a bit scared of it now!! I just thought like any other garment I could take the coat apart and recut the pattern and sew it up! where on earth would I find the double sided textile tape? Ive tried online but cant find anything…. Beautiful job! 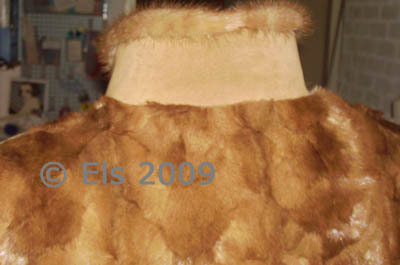 I have not sewn with fur pelts before; only faux fur. I have a game warden nephew who has a beaver hide (he shot and processed) and wants me to make a trapper style, ear flap hat. Do you know of any source for a pattern for such a hat? I was admiring your work and wondered if you have ever done mink fur Teddy Bears? I’d like to start up a company doing them, but I am having a heck of a time finding a qualified person to sew them. If you are interested, please let me know @ rwwooz@aol.com. Any help in this matter would be very much appreciated. Thanks for your compliment on my work. No I have never made Teddy Bears, you could better find another one who lives in your country since I live in The Netherlands. You could try to find one by asking furriers. Hi A very interesting site. I have a Allbook $ Hashfield machine which I use regularly and need a new looper arm. Have you ever had to replace one and do you have any idea where I can get one. I have brought one of these machines..allbrook hashfield fur sewing machines, however once I parted with the cash I realised it didn’t come with a manual and I don’t know how to thread it properly, can you help? HI , THERE , LOOK I HAVE BOUGHT USED ALLBOOK HASHSFIELD SEWING MACHINE AND SUCCESS MACHINE AND NEED THE MANUAL URGENTLY PLEASE … PLEASE HELP ; JAMESAJ@OPTUSNET.COM.AU . see your mailbox for the information how to order a manual. Els, Thanks so much for the clear and precise process description. Just today I brought out the winter clothes, and three fur coats of mine that I want to restyle. I own and operate a sewing and upholstery shop, so I have a lot of machines and knowledge of sewing. As is usually the case, there’s a lot more to it than what’s on the surface. I’ve upholstered with cape buffalo hide, and made a gun and a rifle case out of eland hide, and I work with furniture leather in the shop. I’ve read several books about sewing fur, they’re out in the shop. I will see if I have the one you recommend. That workshop you attended sounds interesting.